All good things must come to an end. 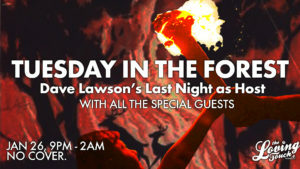 After nearly 200 Tuesday nights over nearly five years, this was Dave’s last night as host of Tuesday in the Forest. 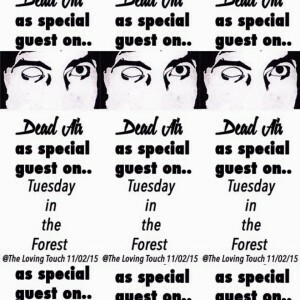 Guest for the night was the new host, Mathias Matthew (Dead Air), who will be continuing the night in his own style. There was a large cast of returning special guests throughout the evening, including Steven Tuthill, Dan Austin, Ryan Cady, Ray Straight, Kenny McNabb, Lauren Mangus, Fabian Halabou, Ben Luckett, Eugene Strobe, Scott Bragg, Adam Stanfel, Jenny Thompson and Ray Thompson. It was a celebration of an era and a fitting finale of record enthusiasts sharing songs with each other and nerding out on the amount of good music in the world. Dave will continue playing records around town at special events, including a monthly early R&B and soul night at Tom’s Tavern. 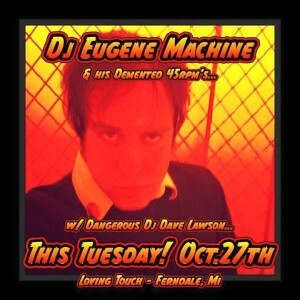 Check his DJ site for more information and links to new mixes and tunes. 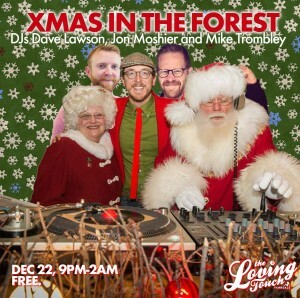 D ave’s Christmas collection is massive (he makes a special Christmas mix each year), and for the second year in a row, he joined forces with WDET’s Jon Mosier and Happy Endings/Macho City host Mike Trombley for a great night of holiday unhits. Jon and Dave do the first half of the night, full of lounge, country and novelty Christmas tunes, then Mike and Dave do the second half of the night with R&B, soul and rock’n’roll tunes. Check out the mix below! 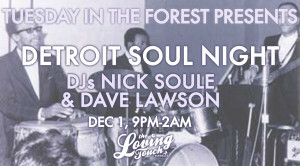 Peoples Records employee and first-time guest Nick Soule joined me for a fantastic night of all Detroit soul music. Nick has a great collection of hard-to-find treasures, and the mix turned out great. Enjoy it below! Once again, Lauren Mangus was my special guest for one of the busiest Tuesdays of the year: Pizzagiving! In honor of the Thanksgiving holiday and the massive amounts of pizza being consumed around us, the first four and a half hours of this extra-long six hour mix are all themed around the Thanksgiving meal. From giving thanks before the meal to every bit of food imaginable, dessert, cleaning up, feeling sick – it’s all there and in order. 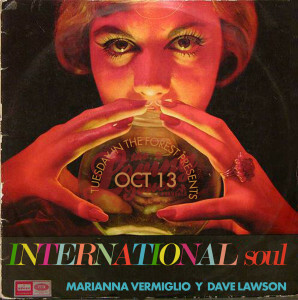 Get ready for a feast of fantastic soul tunes. After having to cancel on Brandon earlier in the year due to the flu, we finally had our long awaited collaboration between the turntables. When Allen Toussaint passed away the week before, I had to pay tribute to the great producer and songwriter. All the songs I played all night involve Toussaint as either writer, producer or arranger. Even after a whole night, there are tons of great songs left unplayed. 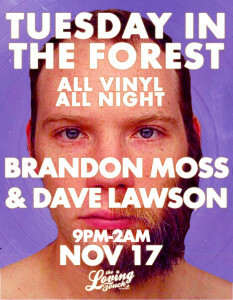 Brandon did a great job of rolling with the theme, playing lots of New Orleans music, plus some newer indie jams too. Check it out below! First-time guest Mathias Matthew (aka Dead Air) joined me for a wide ranging night of jazz, R&B, bubblegum and funk. For the 2015 Halloween mix, I was joined by returning guest and former bandmate Eugene Strobe. 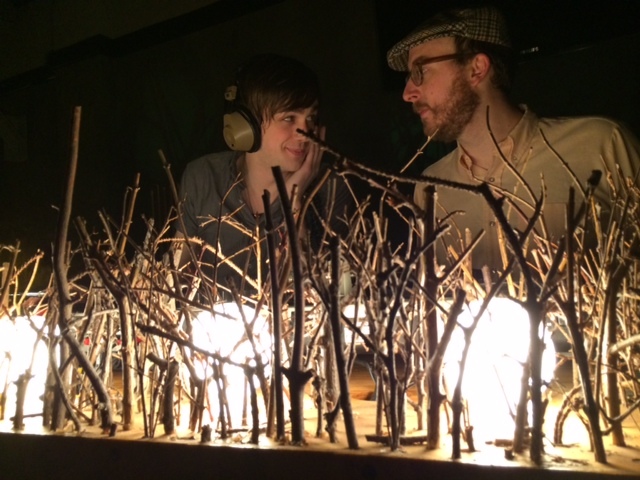 It was a spooky party mix full of blood-curdling tunes – check it out below! Returning guest Marianna Vermiglio brought a night of music from around the world. Bollywood, Cambodian Rock, French Ye Ye, Tropicalia, calypso – we covered a lot of bases, and it was a party throughout. Check out the mix below! Local musician and Selfish Agenda label owner Ryan Cady joined me for a great night of girl groups, indie pop and international jams. Check out the mix below! Due to real life problems getting in the way, my scheduled guest (Jay Portier) had to bail at the last minute on the all country night he had planned. With only two hours to prepare, Ben Luckett pulled together a country box of LPs and joined me for a great night of tunes. Check it out below!